Developed for luxurious silky softness, JASON Cocoa Butter Intensive Moisturising Cream is a high-performance renewal composite that provides you with a smoother, more radiant complexion. 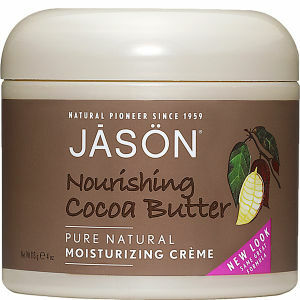 Powerfully combating the effects of punishing environments such as sun, wind and high altitudes, JASON Cocoa Butter Intensive Moisturising Cream will leave your skin beautifully soft and supple. This multi-functional cream is also highly effective for preventing stretch marks during pregnancy.